It's a natural reaction for a young athlete -- any athlete -- and a hockey player in this sense, to go through another agonizing ACL tear in his left knee. Living it once when Fabbri initially injured the knee against the Pittsburgh Penguins on Feb. 4, 2017 was painful enough. But to go through surgery, then extensive rehabilitation and be prepared for training camp last season, play in a preseason game on Sept. 22 at Washington, feel good about playing 19 minutes and have it happen all over again, wiping out the entire 2017-18 season had to be mentally deflating. "You don't really think you're going to have 20 months off from a game you've been playing your whole life," Fabbri said. "I think the toughest part was right at the beginning, finding out I had to go through it again. But once you get past that, you have the surgery again and it's right back to work. Ever since then I've had one goal, to be healthy for a full season and that's what I'm going to do this year." But when No. 15 stepped out onto the ice at the Ice Zone inside St. Louis Outlet Mall for the start of training camp for the 2018-19 season, Fabbri was the first skater on the ice for the 10 a.m. start. Couldn't wait for it to start, eh? "I might have gotten the timing wrong," Fabbri said laughing. "I wanted to get out there and get the feet moving before we stepped into that process." After months of watching his teammates work, that helpless feeling of not being able to contribute himself, Fabbri had a long journey to get back to the days that made him so effective for the Blues pre-injury, particularly the 2016 Stanley Cup Playoffs when he was part of arguably the best line during the run to the Western Conference Final with Paul Stastny and Troy Brouwer. Fabbri was a first round pick in the 2014 NHL Draft, and the 22-year-old gave it a go last year not knowing how his knee would react and what to expect. A prognosis of 6-9 months for such an injury is par for the course, and Fabbri was at roughly seven months with his. He was given the green light to resume his career, but was it too soon? That question will always remain, but going through the proper channels again for an entire season in his hometown of Mississauga, Ontario, a suburb of Toronto, Fabbri finally got the go-ahead again and trained at the BioSteel Camp before heading to St. Louis. Once here, he was part of informal skates and looked good in them, according to Jamie Rivers, owner of Synergy Hockey who directed the players during their informal workouts on the ice. Once Fabbri, who has 66 points (29 goals, 37 assists) in 123 regular-season games spanning two seasons, hit the ice for real Friday, it was almost like being a rookie all over again. "I think I was a little more excited (than nervous) to be out there with the guys again and to through those practices and feel part of the team again," Fabbri said. "It was a good skate and they really worked us. "Everyone was just happy to see me out there again. It's good to have their support." Fabbri was skating on a line with 2017 first-round pick Robert Thomas and Dmitrij Jaskin, and coach Mike Yeo said that although Fabbri looked good, the Blues remain cautiously optimistic. "It's Day 1, so we're not going to jump to conclusions one way or the other, but I thought he looked good," Yeo said. "He's skating, he's shooting, he's doing the things that you'd hope he can do showing his skill level and his pace of play. Everyone's got energy today. I think the work ethic was really good. You would expect that, but as we move along here, it'll tell us more, but we've got belief in Robby and his capabilities. "I think as we move along, I think it was a good practice, tough practice today, but once we start getting into the competition, the 5-on-5 stuff, the games, the scrimmages, that's when we'll get a little bit of a better read, but it's a good first day for him." All the buzz in the offseason was the Blues being able to add forwards Ryan O'Reilly, David Perron, Tyler Bozak and Pat Maroon and rightfully so, but getting a healthy Fabbri in the mix could really make this really a strong crop of forwards. Imagine the possibilities. "I think [Fabbri] looks good," center Brayden Schenn said. "... He looks fast, he looks strong, he doesn't look afraid taking pucks to the net. It's great to see him out there. Finally getting the chance to play with him, I'll be on the ice with him. That's awesome. Everyone's excited for him. He put the time in last winter, this summer to be in the best shape of his life. You kind of see it. I know we haven't played any games yet, but he looks like he hasn't missed a step out there. He looks fast and strong and everyone in that locker room's happy for him and looking forward to seeing what he can do." Vladimir Tarasenko, coming off of surgery to repair a dislocated left shoulder, knows a thing or two about rehabbing a tough injury, but said it doesn't compare to what Fabbri went through. "I know talking about my injury was hard, but talking about Robby, we all feel sad for him," Tarasenko said. "We miss him last two years and I'm real happy to be in same locker room again, see how he skates, see how he enjoys the game. He's a great player who can help a team a lot. It's what we expect from him and we will do everything we can to support him." Support is all the organization can offer now. But once the player is given the go-ahead, there can't be any holding back. That's the risk involved, and one the Blues feel they're ready to take after nearly a year out of surgery. "You can't take off more time and think things are going to be better," Yeo said. "That's playing the game. He's had more than enough time off. Time isn't going to do anything right now. It's a matter of getting out there and getting work and facing the competition, getting your timing back and getting the confidence as much as anything else, getting in the corners, going 1-on-1 into a puck battle with somebody and then finding out that you can come out of it on the right side of things. That's the stuff that he has to get through right now." Fabbri agreed, and thinking about putting his knee in adverse situations on the ice, although natural to do so, can't be a focus. Getting through the mental hurdles was tough in itself. The physical portion is almost the icing on the cake, just to go through it is an adrenaline rush in itself and a feeling of being at or near the finish line. "I think I'm about 10 or 11 months out of surgery, so that's in the back of my head, I don't think about it too much," Fabbri said. "It feels good. I never really had too many tweaks today at all. It never really came up. "... The physical part, I knew I could do it. I've been through that process, I knew what to expect, I knew what the rehab process was. The toughest part was just keeping that motivation and not getting down. I think being in Toronto, surrounded by the group I was with there, having the support from my family helped with the mental part." 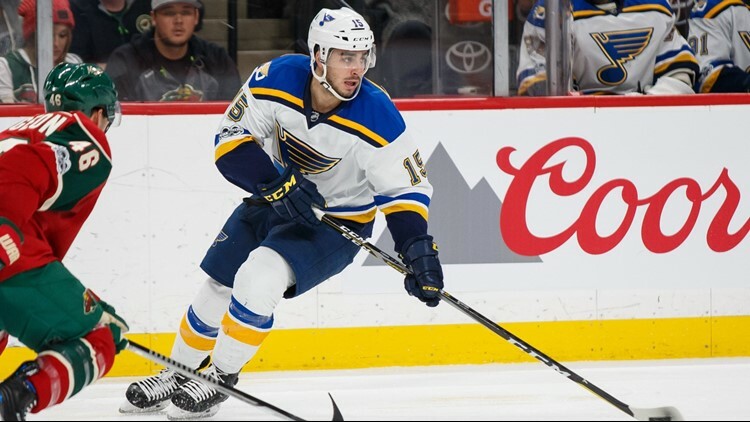 Will Fabbri have doubters? Naturally. And that comes with playing only one preseason game the past 19 months. But that's OK. Fabbri is determined to prove the naysayers wrong and be a key contributor to what the Blues hope is a season that puts them back into the playoffs for the seventh time in eight seasons and back in contention for the Stanley Cup. "People are saying I can't? I know there's that doubt in everyone's mind," Fabbri said. "In my head, there's one thing and I'm confident with how I've prepared for this season and how I feel. I guess you could say I'm going to prove them wrong. "... Everyone hasn't seen me play in a while so I'm looking to pick up where I left off and that starts with today. ... I've had a long time to prepare, to get my legs going, to get my hands going. I feel like I've still got my jump and my quickness. It's just those little parts of your game you can't practice until you're in a game situation. So we'll take those step by step."